Late one night almost 40 years ago on my way to Whale Cove from Rankin Inlet, Nunavut, my snowmobile broke down just past a point of land we call Pangniqtut, about halfway up the west coast of Hudson Bay. I walked back a few kilometres to where I had seen a tent. The occupants, a family of four, were all asleep. I laid out my sleeping bag on the floor and went to sleep. Early the next morning, I awoke to the smell of coffee. Nattat, a man I had known since my childhood, offered me a cup. There was no alarm, no sense of intrusion, just welcome. Inuit have been on this land for thousands of years, so for the 20th anniversary of Nunavut becoming a territory, this is a reflection on the people, the land and the Nunavut Agreement. 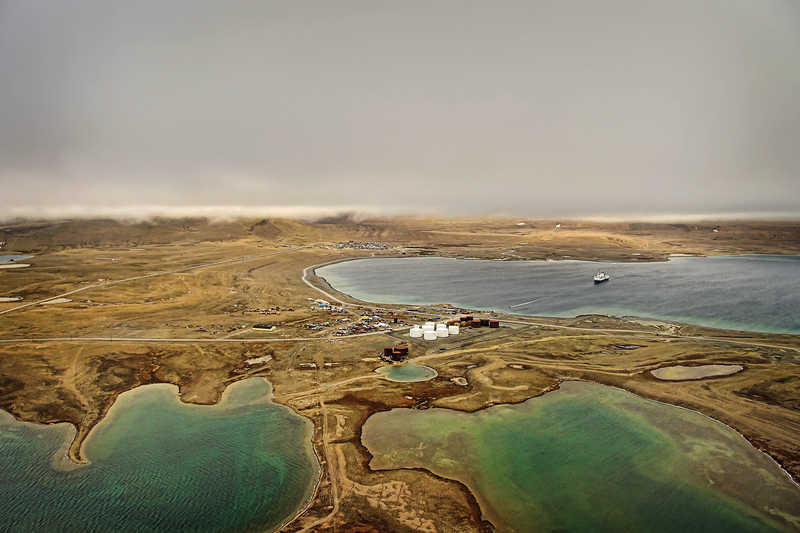 An aerial view of Resolute Bay, an Inuit hamlet on Cornwallis Island. Inuit have always lived in Siberia, Alaska, Northern Canada (including northern Quebec and Labrador) and Greenland. We speak a common language, Inuktut, with many different dialects. We share a common culture. Exactly when Inuit came to North America is a mystery. Some estimate we migrated, following animals, across a land bridge between Siberia and Alaska around 4,000 years ago. Others say there is archeological evidence we have been on this continent for close to 20,000 years. Even in this day and age, Inuit are little understood by people around the world. We are famous for two things that we have invented: the igloo and the kayak. In recorded history, Martin Frobisher reached Baffin Island on Aug. 18, 1576. William Baffin came later in 1616, and explored the bay named for him. Around 1719, James Knight perished near Marble Island in Hudson Bay. All these explorers had a habit of bumbling around, not asking anyone for directions, looking for the coveted Northwest Passage. The most famous of them all was Sir John Franklin, who set sail from England in 1845. He got lost and was never seen again by English people, who searched for him and his two ships for more than a hundred years. Finally in 2014, they found a ship, HMS Erebus, in a strait named Umiaqtalik, which means “it has a boat” in Inuktut. Obviously, some Inuk saw the boat go down in the strait. Perhaps someone should have asked an Inuk what the name means? We have been around the Arctic for a long time — we know a bit about the place. Inuit are a peaceful people. I cannot find, in my Inuktut vocabulary, a word that means weapons. We have harpoons and spears, of course. We have had bows and arrows. But they were all designed for hunting, not aggression. We have never needed to defend ourselves against each other with weapons. That is why there never was a need for land ownership. You build your hut, your igloo or put up your tent wherever you want. You pack up your possessions and take them with you when you leave. Inuit have always been nomads, after all. The land was for everyone. 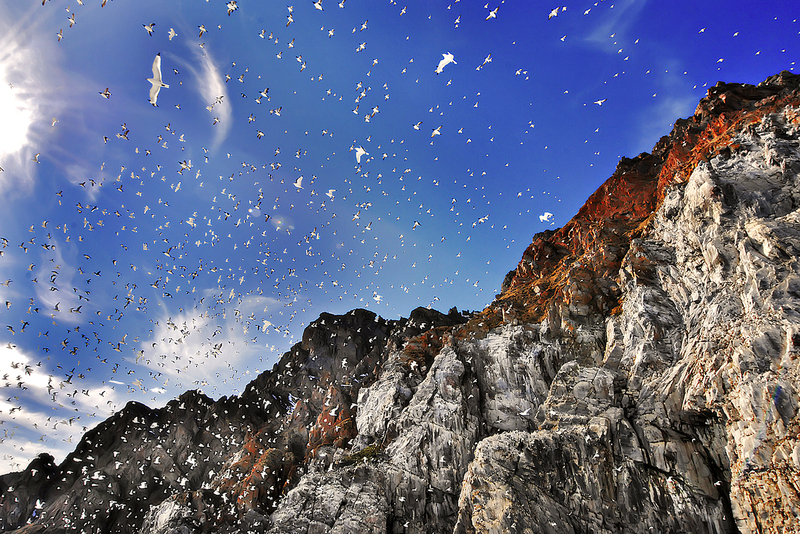 Thousands of seabirds nest on the cliffs of the Bylot Island Migratory Bird Sanctuary at the northern tip of Baffin Island. As I write this letter, I am winging my way westward once more toward Winnipeg. This afternoon I will head home to Rankin Inlet. It is simply amazing how the land changes below the surface. I guess my people are still too young in the modern age to realize the value of land ownership. We have given away at least 82 per cent of our land and almost all of the subsurface rights. We have also thrown in all aboriginal rights. All this for a mere $580 million. Our territorial government spent more than twice that much last year. And we get the money over 14 years. 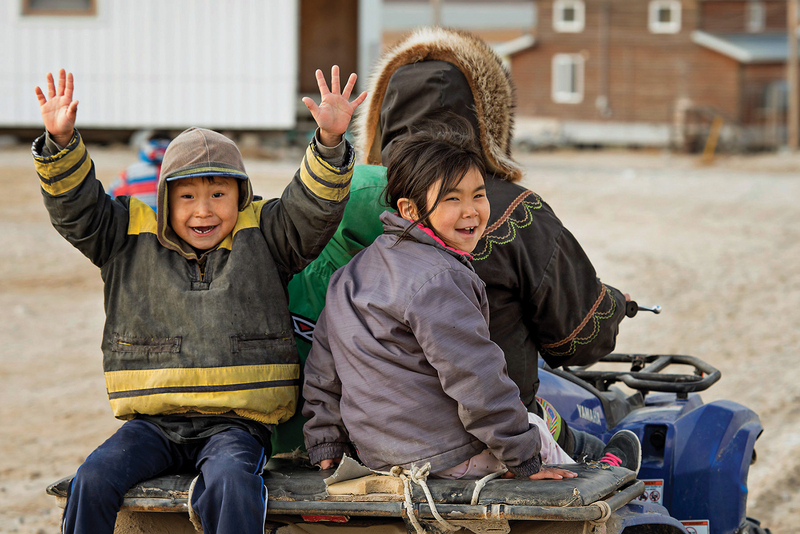 The population of Nunavut is now more than 35,944, according to the last census. Of that population, Inuit comprise a little more than 83 per cent. We have a real housing shortage and one of the highest costs of living in the world. You can fly across the world for the cost of flying from Rankin Inlet to Winnipeg. The longest road is 108 kilometres long; you can’t drive in and out of the territory. We are 20 years older since the agreement went into effect and just getting into the swing of things, stepping lightly into being land owners. But we are still leery about this business of dealing in land, accepting it as a commodity. Since the inception of our stewardship of the Nunavut Territory, two plebiscites have been held, one in 1995 and the other in 2016, to ask the people if they would like to sell land in their communities to homeowners or businesses. Both times, the answer has been a resounding, “No!” We will wait until we understand land ownership a bit better. Now is the time to look over the agreement again and renegotiate some aspects of it. According to the Languages section (Article 2, Part 8, 2.8.1), the agreement is in English, French and Inuktut, but only the English and French versions are the authoritative ones. Inuktut needs to be the primary language. It is spoken by most of Nunavut’s population, after all, and we are forever trying to shore up our ever-diminishing language. It is the language of the land. We identify ourselves by it; we name our places in it; we sing in it; we are it. 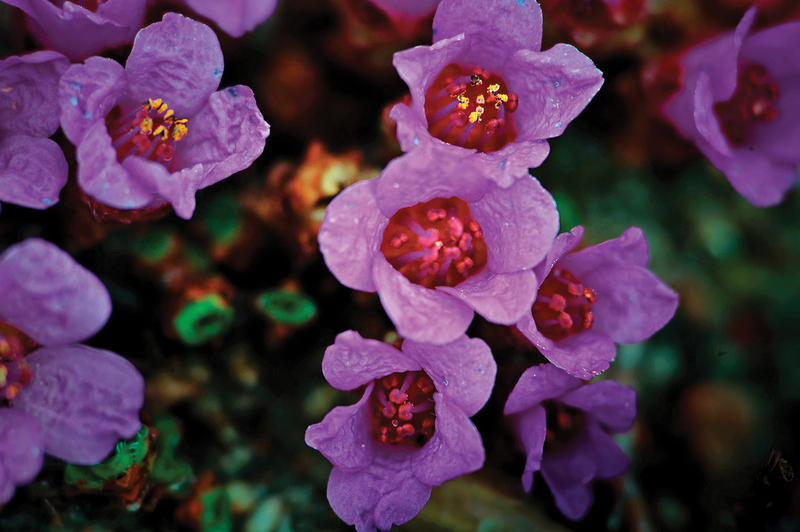 Purple saxifrage grows on the Nunavut tundra as soon as the ground thaws. The word Nunavut means “our land” in Inuktut, and there are 26 communities in the territory. At the western end is Kugluktuk. Its name — Qurlurniq in Inuktut means “river rapids” — refers to the turbulent waters of the Coppermine River. On Ellesmere Island to the north is the hamlet of Grise Fiord, known in Inuktut as Ausuittuq (“land that never melts”). At the easternmost tip of the territory is the community of Qikiqtarjuaq (“big island”) on a big island of the same name that is east of Baffin Island. The southernmost community is Sanikiluaq (“it has a side that is too small,” but I read somewhere that it was actually named after a person) on the Belcher Islands in Hudson Bay just west of Quebec’s northern coast. Nunavut is so sprawling it has three time zones: mountain, central and eastern. 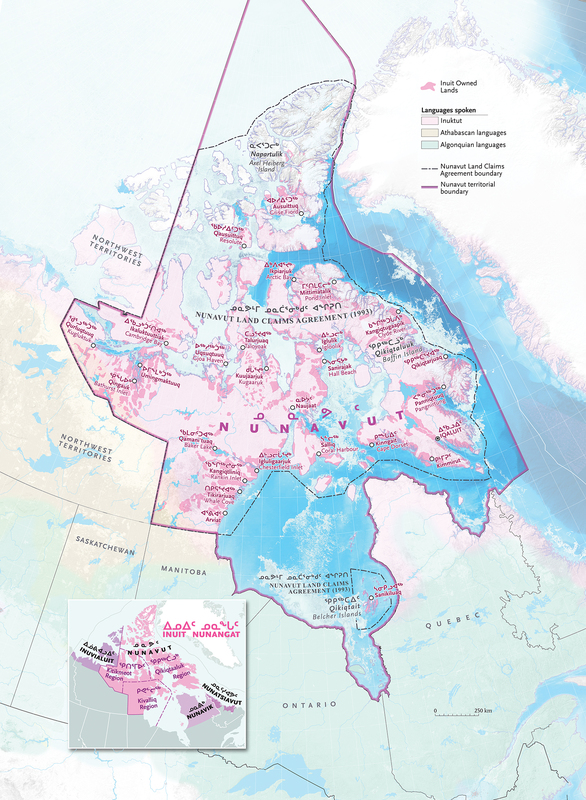 The territory stretches from the northern borders of Manitoba, Ontario and Quebec all the way to the North Pole. The Qikiqtaaluk region, or Baffin region in English, is home to Iqaluit, the territory’s capital. The area is replete with mountains, fiords and valleys to rival any mountainous region in the world. The Kivalliq region in the central Arctic has tundra plains dotted with thousands of lakes. There are long eskers and valleys pushed up and gouged by mountains of moving ice during the last ice age. The Kitikmeot region in the west includes parts of the Arctic Islands. It is a land of rolling hills, raging rivers, tundra plains, Arctic Ocean islands, many Inuit communities, muskox and the Bathurst caribou herd, ice and snow in the winter and fields of tiny, colourful flowers in the summer. Caribou have their calves on the terri­tory’s flat tundra where they can see for kilometres and keep an eye out for Arctic wolves, their main predator. There are polar bears, too. The people of Arviat, on the west coast of Hudson Bay, have to contend with them every fall when the bears migrate north from the Manitoba border, searching for sea ice on which to hunt their favourite prey, the seal. Arviarmiut celebrate Halloween in their community hall to keep the kids away from marauding polar bears that sometimes wander the streets. Every spring, birds of all kinds — snow buntings, sandhill cranes, snow geese, tundra swans, ducks, falcons — flock by the thousands to Nunavut to lay their eggs. There are 11 migratory bird sanctuaries in the territory. Auks and other seabirds nest on the high cliffs of the small islands in the Northwest Passage and in Hudson Bay. Geese and ducks nest in marshes around the McConnell River Bird Sanctuary, just south of Arviat. Others nest in Queen Maud Gulf on the coast of the Arctic Ocean. Songbirds and shorebirds find hiding places on the tundra to lay their eggs. In the fall after they have fledged their young, millions of birds fly south. Just west of Ellesmere Island, at the northern end of the territory, is Axel Heiberg Island. This island has just about the only forest — of sorts — in the territory. It is home to the remnants of a 45-million-year-old mummified forest of dawn redwoods. All of Canada’s provinces and territories are represented by various official symbols: birds, animals, flowers and trees. But Nunavut is the only one without an official tree. Perhaps we should consider the mummified dawn redwood? Ladanian Ikuallaq (left) and Puyuaq Uttaq ride through Gjoa Haven on an ATV. We had a big party in Iqaluit on April 1, 1999, the day Nunavut became a reality. We told stories about Inuit and where we come from. We told stories about Kiviuq, the greatest character in Inuit legend who was the first person on Earth and is still among us today (like the forest on Axel Heiberg Island). We did a stage play about the arrival of Martin Frobisher and about our struggles toward that momentous event, the implementation of the Nunavut Agreement. We had fireworks shooting through the skies above Iqaluit. It was indeed a time for celebration. When the festivities were done, we had time to breathe and take stock of our new status in our country, Canada. It was a sobering thought to know that we had come a long way and arrived at this point, mostly unscathed. We spoke our language. We told our stories. Although many of us had (and still have) reservations about the details of the Nunavut Agreement, we had this new pride in who we are, Inuit in our own homeland. And little things began to happen. Simon Alaittuq, the principal of the Leo Ussak School in Rankin Inlet, made an announcement, “From this day forward, every student in this school will be called by his or her Inuktut name.” That one little thing led to kids speaking to each other in their own language. I heard them in the playground, calling to each other in Inuktut. It was a magical moment. Quviasuqattaritti (May there be happiness in your lives).